There was something special about our family shoot with Pamela and Richard. From the moment we arrived at their home, we were treated like friends. Capturing their family portraits in their Lincolnshire home during the British summer made things a little more nerve-wracking. The photoshoot was a wedding anniversary gift for each other, as they wanted to capture their family together and capture some memories. Usually, with location family portrait sessions, the weather is simply a hinderance. If it rains, we simply rearrange the session for another time. 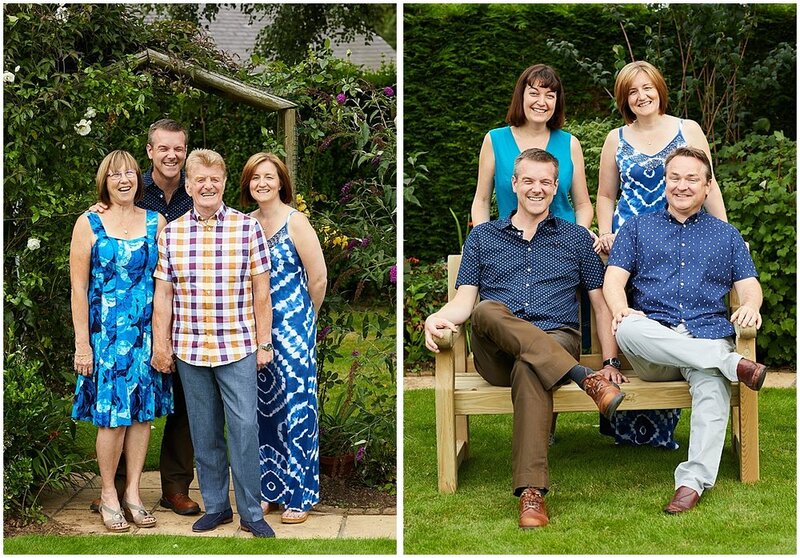 However with Pamela and Richard’s family, they are all incredibly busy people and booking the date of their shoot was done months in advance. During the week leading up to the shoot, we became amateur meteorologists. I think Lisa had four weather apps open on a daily basis at one point. Obviously we followed the scientific principle of believing whichever app gave the most favourable weather for the day and arranged a backup plan of shooting in a studio setting. Luckily there was a pocket of nice weather for the day of the shoot with bad weather looming either side and we were able to capture the family in the family garden, which is one of their favourite spaces. Pamela wanted more relaxed family portraits, ones that captured each personality. The fact that the family were happy to have fun around the camera made capturing them was great fun. They even made sure Carl had a beer in his hand after he had finished shooting. Pamela and Richard were delighted when we showed them the photographs for the first time, which is why we love photography. As Pamela herself said "It tells the story of our day together" which is exactly what we aim to capture. While we work on our meteorology, you take some time and have a look at the images.